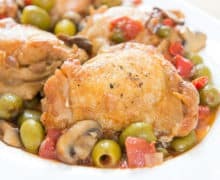 This Chicken Cacciatore, or Hunter-style chicken, is a delicious and healthy one-pot meal, with golden braised chicken thighs, mushrooms, sweet bell peppers, tomatoes, and green olives. This recipe proves that you can do cozy AND healthy at the same time. Remember when I said there were a bunch of Whole30 recipes that were SO good that I will eat them after the program too? Here’s another one of those! 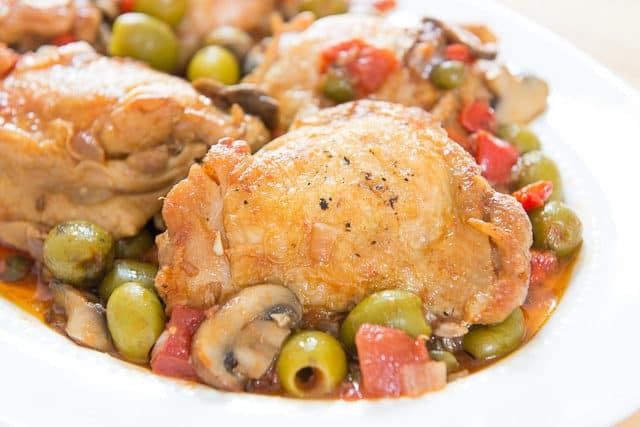 Chicken Cacciatore is a well-loved recipe for many cooks, but this version manages to be completely delicious and satisfying, while being friendly to all the main eating styles that I can think of. Chicken thighs in general have really become a staple of my kitchen lately. Am I becoming a dark meat girl? I haven’t bought chicken breast in over a month and feel like there’s something magical about the bone-in, skin-on chicken thighs. 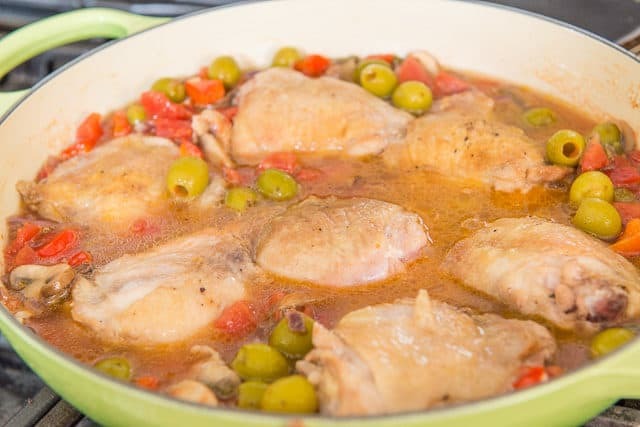 If that cut isn’t your favorite, I think this recipe is well-suited to drumsticks too, or chicken breast if you used cutlets and cut down on the cooking time and broth. I adapted this recipe from the Whole30 cookbook, but I changed the cut of chicken, added green olives and a little bit more bell pepper, and omit the basil. This rendition is also made without wine because it’s not allowed during Whole30, but honestly I don’t think this dish needs it anyway. The sauce is plenty flavorful, aromatic, and balanced without it. To get started, sear some bone-in, skin-on chicken thighs in a braiser pan. Remove the chicken from the pan, which should leave a couple tablespoons of fat, plus lots of golden brown bits from the seared chicken. Simmer until the chicken is fully cooked through, and the liquid has reduced down. I usually enjoy this dish for dinner as the entire meal, or sometimes I will add this Zucchini Arugula Salad or White Bean Salad as a side. If you’re up for a splurge, this Asiago Black Pepper Bread is absolutely delicious as a vessel to soak up the sauce. 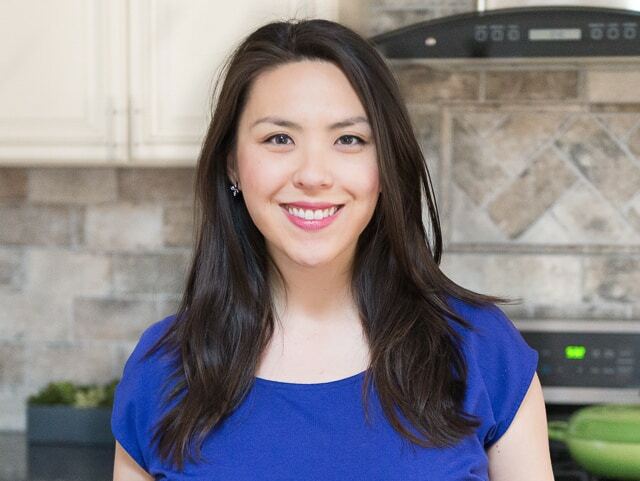 You can browse more Whole30-compliant recipes here in my recipe index. 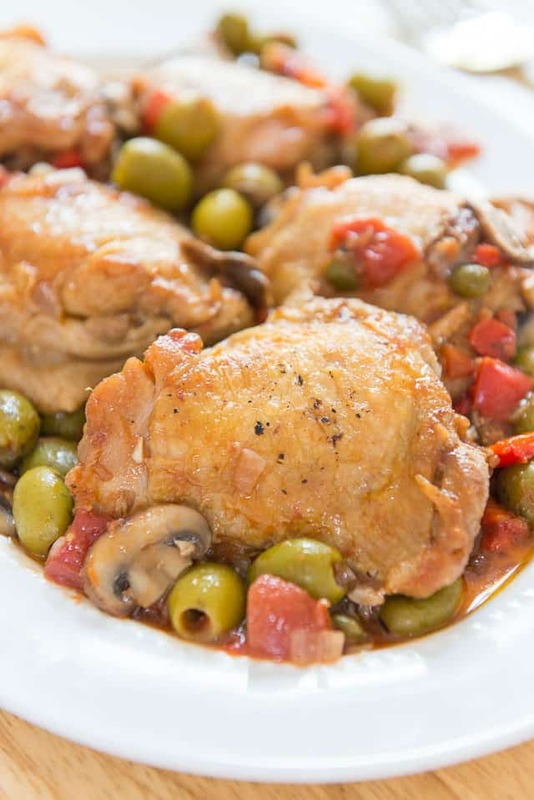 Can Chicken Cacciatore be frozen? Yes, this freezes beautifully. Store in the freezer for up to 2 months. Can Chicken Cacciatore be made ahead? Yes, you can cook the entire dish ahead of time, store it in the refrigerator, then heat in the oven to rewarm. Because it’s a “saucy” dish and the chicken thighs are not meant to be crispy, you don’t have to worry about making this ahead of time. If you want to crisp the skin, pop the chicken only under the broiler for a few minutes, or use a torch. 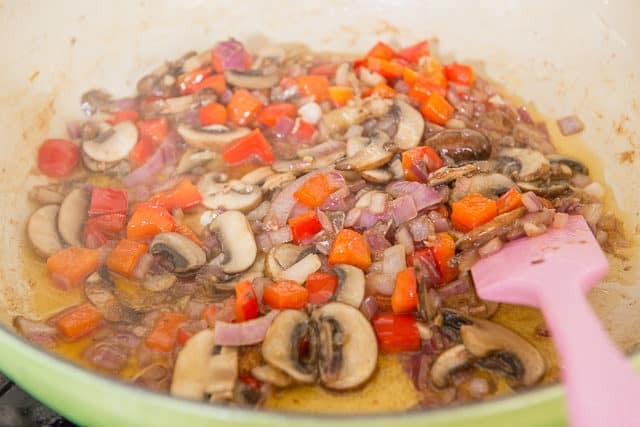 What to serve with Chicken Cacciatore: This is Whole30, paleo, gluten-free, etc on its own, but some great side dishes to serve with it would be rice, potatoes, crusty breads to soak up the sauce, or a salad. How to reheat Chicken Cacciatore: To re-warm, microwave the chicken cacciatore, or bake in the oven until warm (try 350F for 10 minutes). How long does Chicken Cacciatore keep? Store in the refrigerator for up to 5 days, or freeze for up to 2 months. 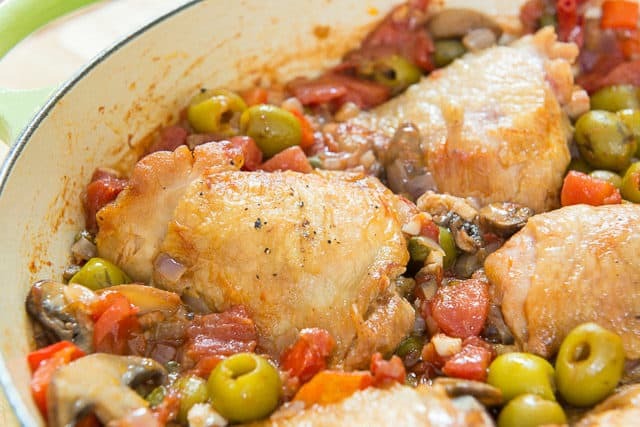 This Chicken Cacciatore is a delicious and healthy one-pot meal, with braised chicken thighs, mushrooms, bell peppers, tomatoes, onion, and green olives. 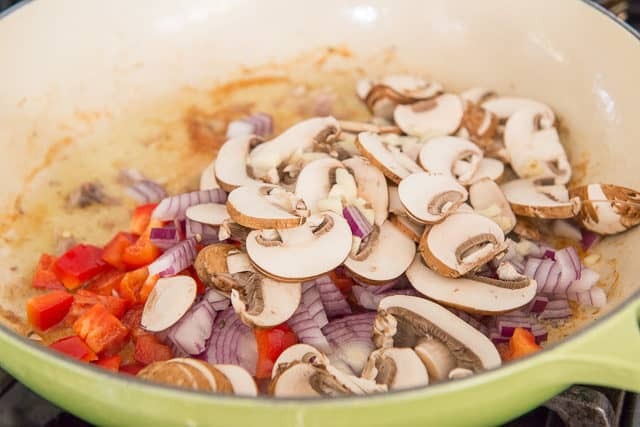 Heat a large skillet or braising pan over medium heat, then add the olive oil. Season the chicken thighs with the salt and pepper, then place skin side down into the pan, and cook for 5 minutes, until golden. Flip the chicken thighs and cook for 5 more minutes, then remove to a plate. 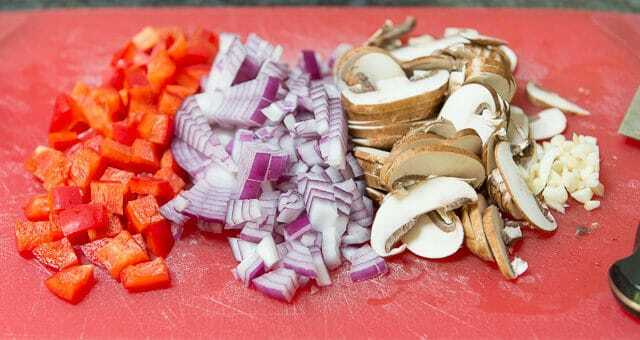 Add the onion, bell pepper, mushrooms, and garlic, and cook for 10 minutes, until softened. 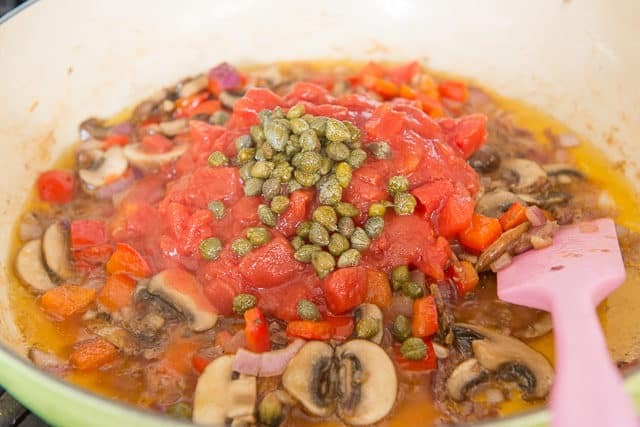 Add the capers, tomatoes, green olives, and chicken broth, and stir. 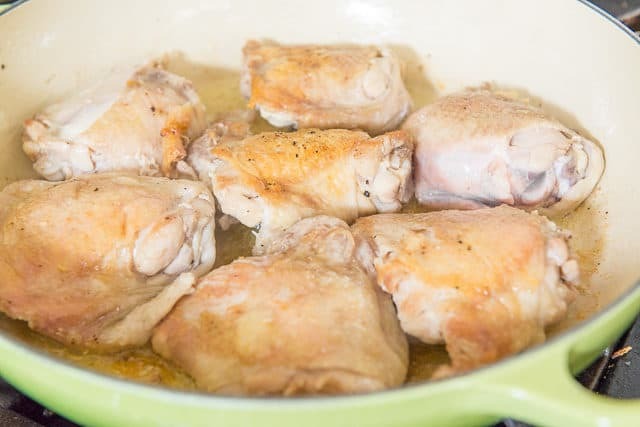 Arrange the partially cooked chicken thighs back in the pan, and cook uncovered for about 20 minutes, until it reaches an internal temperature of 170F. Leftovers will keep in the refrigerator for 5 days, or freeze for up to 2 months. Post updated in December 2018. Originally published November 2017. 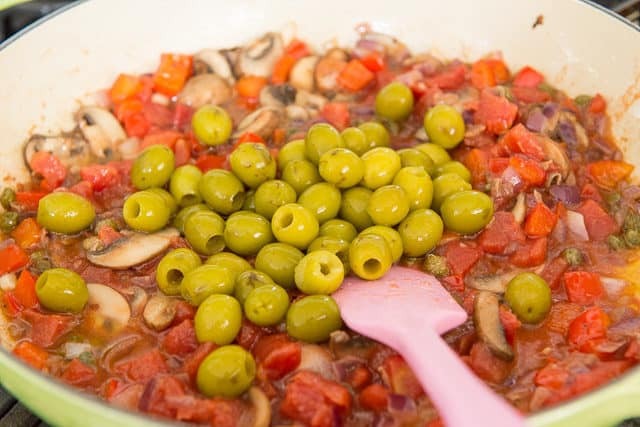 Are the capers and olives essential to the recipe? I love chicken cacciatore but always thought it was too time consuming to prepare. Thanks for the great photos and step by step instructions! Hi Susan, you can leave them out if you’d like. Enjoy! I enjoyed this far more than I expected, since I didn’t know what to expect from a Whole30 recipe. Thanks! This was delicious. I left out the capers and olives, as I am not a fan, added some cayenne pepper and fennel seed. Apart from that, all was the same. Was great. Served it with a small mesculin lettuce side salad. Highly recommend.